This site is run by Amanda. 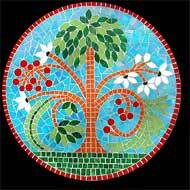 Our kits are carefully designed to encourage beginners to make a fabulous mosaic for themselves. All of our kits include a photograph and pattern, with each cut tile drawn on the pattern for you to trace, making it easier for beginners. Please note that our kits include the photograph, pattern, tiles, grout, board and instructions. REMEMBER: if you are buying a kit, you will need to purchase cutters and glue. If your order exceeds the $20.00 Australia Post limit when weighed, we will notify you of further postal charges before we post your order. We are going to post special promotions for the upcoming Mother’s day. Stay tuned and visit us often. Meanwhile you can check our friends at The Eternity Rose for their Mother’s day gift offers. Please allow up to 4 working days for shipping within Australia and up to 10 working days for shipping overseas.